TRACEY Bell has a colourful and dynamic history with her hometown of Edmonton. Years before making a name for herself as an award-winning impersonator of classic celebrity “divas” at events around the world, Tracey Bell grew up in North East Edmonton and was impersonating celebrity favourites in her earliest school years. 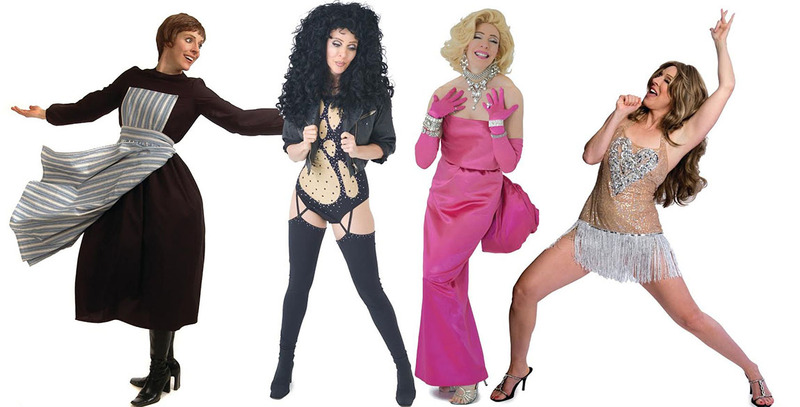 Tracey Bell portraying (from left) Julie Andrews, Cher, Marilyn Monroe, and Celine Dion! “I did my first impersonations of Cher at recess at York Elementary School. My friend and I would alternate playing Sonny Bono and Cher,” she says. As she continued on to Steele Heights Junior High and M.E. LaZerte High School, Tracey added impersonations of Marilyn Monroe, Judy Garland, and Nana Mouskouri to her budding celebrity repertoire, winning drama awards and dancing in the opening ceremonies of the 1978 Commonwealth Games. After working for The Edmonton Journal in the circulation department and entering the University of Alberta to study sociology, Tracey Bell’s career turning point came in 1985 at a famed Edmonton night spot – Goose Loonies. “I was a full-time student, working as a coat check attendant at Goose Loonies. They wanted a Tina Turner routine because "Private Dancer" was all the rage at that time. I asked to try out and it went over so well that I left school and they hired me full-time,” she recalls. As the in-house act at Goose Loonies, Tracey Bell developed impersonations of dozens of other characters including Liza Minnelli, Madonna, Janis Joplin, and Dolly Parton. After going independent three years later, Tracey created a one-woman show called “8 Divas in 44 Minutes”, highlighted by lightning fast costume changes and comedic impersonations. Tracey Bell’s celebrity impersonation shows have taken her across the globe for corporate events and film and television opportunities – all to great acclaim. Now based in Vancouver, she’s previously been named Entertainer of the Year at the Canadian Event Industry Awards and at the BC Event Industry Awards. She’s guest-starred on The X-Files as Cher, sang to Pierre Trudeau as Marilyn Monroe, and performed for the Consul General in Shanghai as Celine Dion and others. Tracey also worked with Hilary Swank, Arianna Huffington, and First Lady Cherie Booth Blair when she hosted The Power Within For Women. Even with her success, Tracey always remembers where she came from and returns often. “I’ve performed many times at the Klondike Days Exhibition, as well as the SAGE Awards for the Seniors Association of Greater Edmonton, the Glenrose Hospital’s chocolate-themed fundraiser and many private corporate events. It’s always special to come back to where it all started and do what you love for the great people here,” she says. Saturday, June 4th marks Tracey Bell’s next homecoming to Edmonton. She will be performing at End of Steel Park as part of the 36th annual Edmonton Pride Festival. She’ll be doing her trademark celebrity impersonations in her favourite city. If you’ve never seen her, it will be well worth a look. For more about Tracey Bell, click HERE.